Himalayan eagles soared around us as we caught the thermals up and made swooping turns to the left and right going down. It took a few minutes to feel comfortable in the seated position, with nothing below you but the terraced farmland. At least with skydiving you know you're going straight down. Paragliding is all about staying aloft. I can't imagine a sensation closer to flying then being up there with the birds. It was fantastic. I jumped from a mountain in Rio once to hang glide my way to the beach. We soared for nearly 20 minutes in the air overlooking the city, the ocean and the mountains…..an amazing experience. 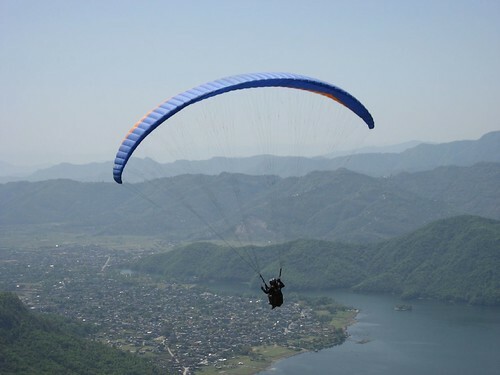 Thanks for this post…A new to-do – paraglide and a friday flashback of my own. Handgliding in Rio is definitely one of those “musts” on my travel list. Maybe just because I always see people doing it on TV when they’re in Rio. Either way, I’ve yet to handglide and it seems like as good a place as any to try it.